This Jacket is pretty snazzy. Dean declares that it’s made of canvas, the first time he wearsit. It’s brown, with leather patches on the shoulders and forearms. It’s got only one visible front pocket on the left breast, but what looks like a zippered lower side pocket that sits pretty far back on the hip. 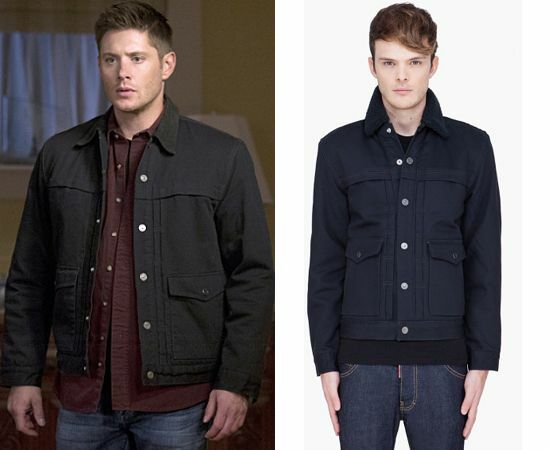 In Ask Jeeves (10x06), Dean wears this jacket from when they arrive in New Canaan until the end of the episode. In The Hunter Games (10x10), Dean wears this coat to go meet Crowley in the alley and then again at the end of the episode to go meet Claire at the river-front park. In Book of the Damned (10x18), Dean is wearing this coat at the end of the episode when he comes back from picking up pizza with Charlie and greets a returned and newly re-graced Cas. In Just My Imagination (11x08), Dean wears this when they go to investigate the Sparkle’s death. He takes it off briefly in order to wear a disguise to view Sparkle’s body, but other than that, he keeps it on until the end of the episode. In Love Hurts (11x13), Dean wears this when he arrives back at the motel room with take-out, after they have changed out of their suits. He is still wearing it when Melissa arrives in a panic, but in the time-lapse after Sam starts researching, he removes it and throws it over the back of one of the motel chairs. He then grabs it on his way out the door after the Qareen attacks. He throws it into the backseat with Melissa, but then when he pulls over at the side of the road so that he and Dean can access the weapons from the trunk, he pulls it out and puts it on. He then wears it for the rest of the episode. 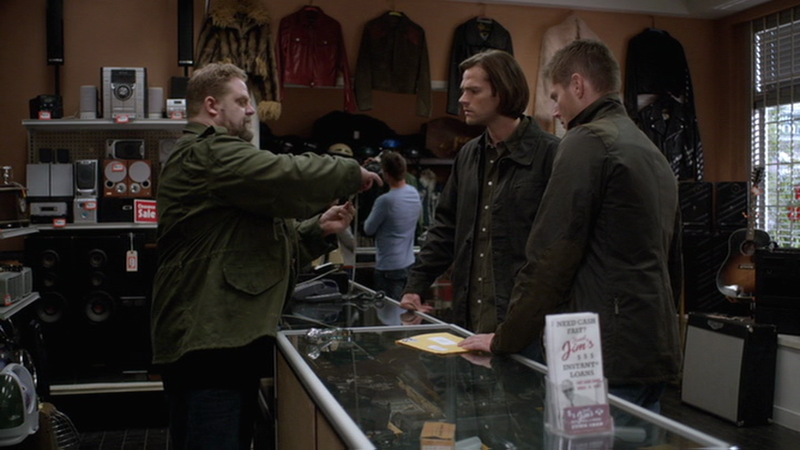 In Hell’s Angel (11x18), Dean wears this coat when he and Sam go to meet Crowley – he continues to wear it whenever he is outside the Bunker. 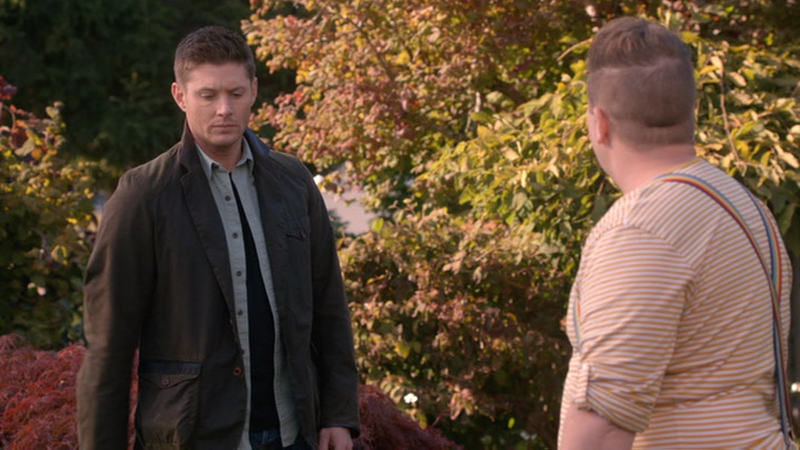 In American Nightmare (12x04), Dean wears this coat after they interview the family, and Dean decides that the social worker must be a witch and he goes off to confront her. He wears it for the rest of the episode. In The Future (12x19), Dean wears this jacket from when they track Castiel down at the motel until the end of the episode. Man do I love this jacket! It's Barbour Beacon Sports jacket that they made only for James Bond Skyfall one. People loved it so they released it for the people for the best price ever... (around 640$) So im struggling to get it. And I heard that it's gonna be discountinued in a few months OR are already discountinued but still few can be found in the retailer shops. Thanks so much! I don't mind if you spam each page, but you could also just make a list and spam the S10 page (or DM me the list) - it's up to you! It takes me so long just to get the season's clothes up, that I just can't take the time to do brand research too. Certain things I recognize, mainly because they don't remove the labels, like all the Carharrt shirts - and I've gotten pretty good at recognizing WindRiver shirts, but that's about it! So, any help is greatly appreciated. This one looks to me like the 2nd denim shirt from levi's that he weared many times since season 2? But i might be wrong on this one. But this grey colour is not there anymore. Levi's Salex Sherpa Trucker Jacket (discontinued... shame) Looks so much on Jensen than on this awkward guy. Dakota again but in blue colour. I have them both, nice jackets but so baggy fit I recommend buying size smaller if anyone is reading this. That's all I know for now, shirts are difficult as fk for me since i don't live in USA i just don't know these brands. That's also part of my problem with knowing brands - I'm also not in the US. Mind you, I'm also in Vancouver, so that gives me a little bit of an advantage for the stuff they buy at Mark's Work Warehouse. Though, I've been told from industry people that a lot of productions shop at the Bay, because they have a good returns policy... I don't know if SPN does though. Wow, that model is awkward in the sherpa jacket. I really love that Berkman Trucker Jacket! Alright, all info should be added! Thanks so much for your help! That is a very nice jacket. 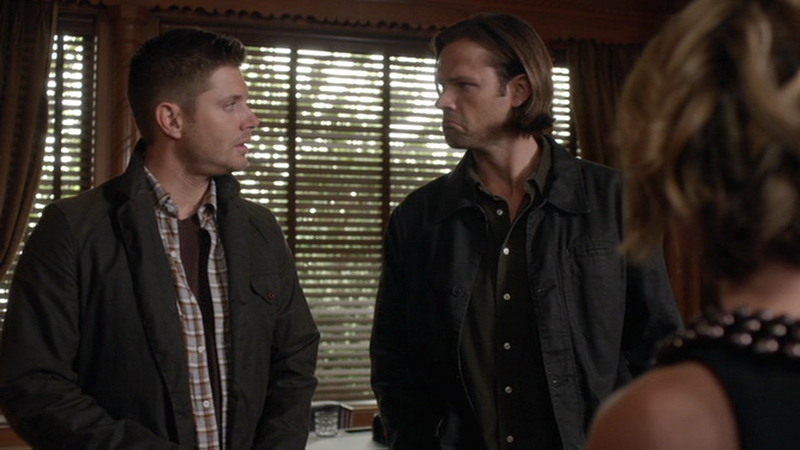 When the butler made that comment to Dean about this jacket I thought what a snob. That's a NICE jacket, how can he look down on that. I didn't know this was made specifically for Skyfall. That's pretty cool. I might have to get me one someday.